Former Newtown Township Manager Kurt Ferguson highlights financial trends that could negatively impact 2019 revenue. Mr. Ferguson focused on Earned Income Tax (EIT Definition) Real Estate Transfer Tax Definition revenue. These sources of revenue are “volatile” in the sense that they depend on the state of the economy and the actions of neighboring townships that are beyond the control of Newtown planners. Also read “Trends in Newtown’s 'Volatile' Earned Income and Property Transfer Taxes”. 15-Oct-2018: Resident and non-resident EITs account for about 79% of Newtown’s total tax revenue and 55% of the Township’s yearly TOTAL revenue from all sources. As reported in the October 9, 2018, issue of Newtown News Update, Newtown’s financial situation, according to our auditors, is stable as long as the EIT revenue remains stable (read “All’s Well in the Garden as Long As…”). It is prudent, in my opinion, to examine the data for the past several years to determine if the trend verifies EIT revenue will remain “stable” in the future. According to data from the 2017 Financial Report and Audit, there was a substantial increase in total EIT in 2017 compare to 2016 primarily due to better economic conditions with more people employed and/or making more money (see Figure below). TOTAL EIT, which includes both resident and non-resident contributions, increased by over $1 million in 2017 compared to 2016 but is estimated to decrease by 12% in 2018. The 2019 budget anticipates a 3% increase in total EIT. But can we expect that trend to continue? Compared to the high of about $8.37 million in 2013, the 2017 EIT revenue represents a 6% DECREASE. This was only partially due to an “unusually high” Delinquent Residential EIT Collection of $320,519.30. According to the Manager’s Budget Letter submitted to the Board of Supervisors (BOS) at the October 15, 2018, Budget Presentation, the estimated total EIT collected by the end of 2018 will be $ 6.938 million – a decrease of 12% compared to 2017. The 2019 Propose Budget estimates a 3% increase in total EIT compared to 2018; i.e., $ 7,120,000, which is still 3% below the average of $ 7,320,692 for period of 2013 through 2018. 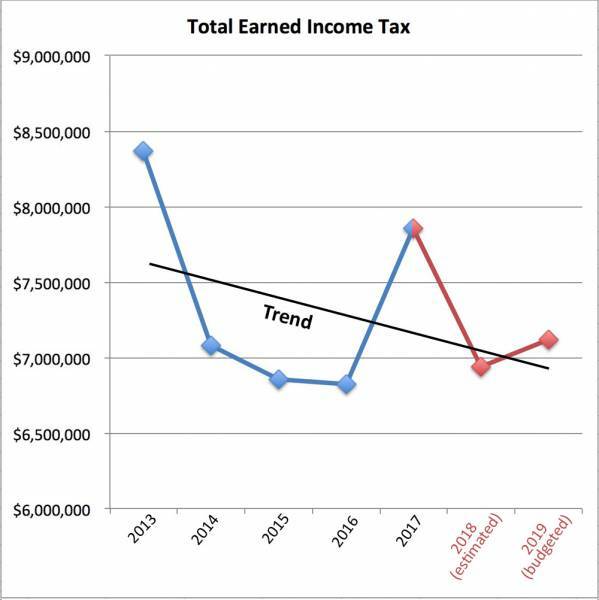 It is obvious that EIT is a “volatile” source of revenue for the Township and the trend is downward. Aside from the impact of general economic conditions, the Town’s EIT revenue can be impacted by businesses moving out of town and by decisions of neighboring towns. For example, Newtown lost approximately $650,000 in EIT plus an additional loss of $44,000 in Local Services Taxes when Lockheed-Martin left town. Add to that the loss of $198,000 when Middletown Township implemented an EIT and a loss of $202,376 when Bensalem did the same and the result is a total loss of $1.1 million.